The unit began life as UP 8521, an SD70ACe (serial number 20056723-098) built in May 2006 by EMD at London, Ontario, Canada. The unpainted unit was delivered to Union Pacific on 24-May-2006, and upon arrival, it immediately went north to the Wisconsin & Southern's Horicon, WI, shops, arriving on 27-May-2006. It was painted, renumbered to UP 1989, covered in a blue tarp, and returned to UP at Butler, Wisconsin, on 8-Jun-2006. From there, it moved behind UP 4439 as part of SBUCB-10 to Council Bluffs. It completed its trip to Denver the next day as the second piece of equipment on SCBDV-11, again with 4439 in the lead, but different passenger cars trailing behind. The unit was unveiled on Saturday, 17-Jun-2006 in a special ceremony behind the Superintendent's Office, just to the west of Denver's North Yard. In addition, due to the great amount of interest by the fan community, another three hours of viewing time was announced for railfans on the following Sunday morning. A bit after noon, at the end of Sunday's viewing, the unit was moved to Burnham for final inspection and setup. The unit's first assignment was a day later, when it lead the MNYPU-19 (Manifest, North Yard to Pueblo) southward. 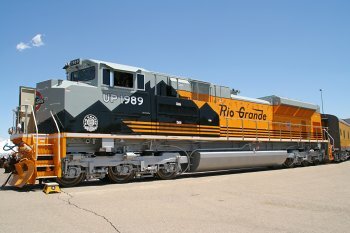 UP 1989 is largely expected to stay in captive service on the nightly MNYPU/MPUNY (Denver North Yard - Pueblo manifests) on Colorado's Joint Line. Unfortunately, both of these trains largely exist at night, only being visible in daylight near the destination termina when they're running significantly behind. While this is the unit's normal run, the first month brought some interesting departures from this routine. The first occured on Thursday, 6-Jun-2006, when the unit left for its first trip west. It was placed on the point of MNYGJX-06, a Denver-North Yard to Grand Junction extra. Once on the Western Slope, it was temporarily placed pulling coal trains over the North Fork, between Grand Junction and the mines east of Delta. On Sunday night, 9-Jun-2006, the unit was sent back to Denver on the point of MRONY.